Here are some questions about the “Revive Time: Kaki Tree Project” from children around the world. What are the seedlings from the bombed kaki tree? In 1945, the atomic bomb was dropped on Nagasaki. This powerful bomb killed thousands of people and burned down the city. However, there was a kaki tree that miraculously survived the bombing. The “bombed tree” was scorched and weak. About 50 years after the bombing, it was 1994. As Mr. Masayuki Ebinuma, an arborist, who lives in Nagasaki Prefecture, treated the damaged tree, it recovered and started bearing fruit every year. Mr. Ebinuma saved seeds from the fruits and carefully grew them, and these are the saplings from the bombed tree. He has started to hand them out to children as a symbol of peace. Can we eat the fruits of the saplings? Yes, we can. According to the radioactivity measurement conducted by Nagasaki University School of Medicine, there is no problem of eating it. As these are astringent (bitter), we can eat only after drying them. At Tokyo’s Yanaka Community Center, people make Hoshigaki, dried persimmons, after harvesting persimmon fruits at the harvest festival in October and eat them at the New Year. Where is the bombed kaki tree? It is now in Wakakusa-machi, Nagasaki-city. The place is located approximately 900 meters from the ground zero. The tree is 6 meters in height and said to be 150 years of age. What is the Kaki Tree Project? This is an art project to encourage children around the world to nurture the saplings from the survivor tree. Through nurturing the trees, children can learn the power of life, which can overcome obstacles in life and the importance of peace. The kaki trees have been planted in which countries? The siblings of the kaki saplings are all over the world. So far, in 23 countries, including Italy, Switzerland, France, USA and Germany, they have been planted; more than 250 places in total. How can we participate in the tree-planting ceremony? Event schedule and the most up-to-date information will be posted on this website. Please visit us and check out the latest news! Why art events are held when they plant the tree? Because we hope all children to remember the kaki tree through the pleasant memories of the event. What do you do in the art event? Anything! Together you can draw, dance, sing, etc. A large number of people marched through the streets at one event, while singing and at another event, participants released a lot of balloons into the sky. You can create an art event in any way you like. We create artworks together at the event. Are they going to be displayed somewhere? Artworks created by all of you at the tree planting ceremony and kept by the Kaki Tree Project Executive Committee might be displayed at museums. Maybe someday you will see your artwork exhibited in a museum in a foreign country! The name of Kaki came from where? The Japanese word “Kaki” is said to be derived from “Kagayaki (shine)”. They say it is so named because the persimmon skin turns red and shines as it matures. In the latter half of the 18th century, persimmons spread from Japan to overseas. Therefore, the scientific name of persimmon in Latin is “Diospyros kaki.” “Diospyros” means “God-given food”. How many types of persimmons are there? There are sweet (non-astringent) persimmons and sour (astringent) persimmons, and it can be further divided into four breeds with or without seeds. There are said to be more than 1,000 breeds in Japan only including well-known breeds that are grown throughout the country such as Fuyu, Jiro and Hiratanenashi. The saplings from the bombed tree belong to a breed called “Tongo”. How do we eat the fruit? We can eat persimmons raw after peeling the skin, and if they are astringent like those from the saplings of the bombed tree, we can eat them only after drying. Hohigaki (dried persimmons) are made after peeling the skin, then hang them until a white powdery bloom naturally appears on the fruit. By drying them well, they become sweet because the bitter tannin is removed. Another way to remove tannin is to take the hull of the fruit and soak it in a solution contains alcohol, then put it in a plastic bag, remove air, seal up and leave for a few days. 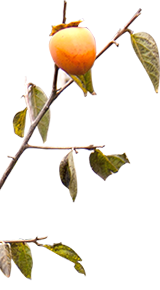 What kind of nutrients are contained in persimmon fruit? Persimmon fruit contains a lot of pectin and carotenoid, and a good amount of Vitamin C. It is rich in potassium, which helps reduce water retention and is effective for hangovers and swelling of foot. Furthermore, dietary fiber generated from the process of drying helps relieve constipation, provides health benefits for beauty as well. How do we grow the tree in the cold? We can grow the persimmon tree in a pot. Bring it inside the house and keep it warm from October on. Once you harvest the fruit, take it out and let it adapt to the cold until the mid December. When it really gets cold, waste material that prevented buds from growing is decomposed and the spontaneous rest period then terminates so the tree becomes ready for sprouting buds at the end of December. To prevent twigs from breaking by snow, you can place it in a space under the eaves or support twigs by suspending them from above with wire or setting up a wooden frame. Where is Nagasaki located in Japan? Is it close to Hiroshima? Nagasaki Prefecture is located in the western part of Japan and in the northwest edge of Kyushu island. It is surrounded by the sea on the north, west and south. Small islands such as Tsushima, Iki and Gotou Islands belong to the Prefecture. Both Hiroshima and Nagasaki are located in western Japan; however, they are not very closely located. The distance between the two cities is approximately 300 kilometers.